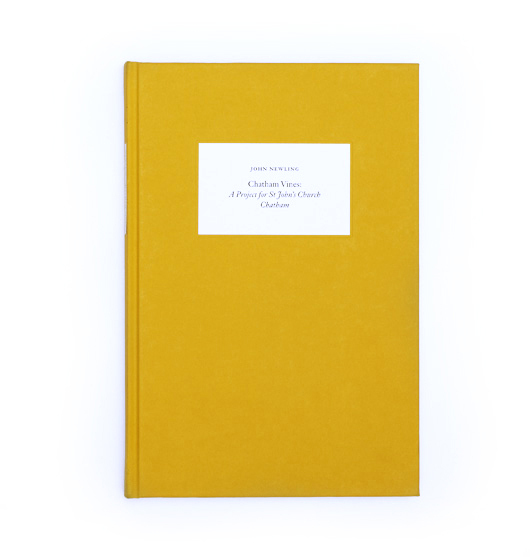 This limited edition hardback artist book documents John Newling's award winning Chatham Vines installation in St John's Church Chatham, Kent. In September 2004 thirty two Pinot Noir grape vines were planted in the central aisle of the disused church positioned either side of a 15 metre steel construction. The vines were grown for one year using hydroponics technology. At night the church was lit from within and two cameras continuously streamed images of the project to a dedicated website www.chathamvines.com. Before the vines were removed the grapes were harvested and made into wine, some of which was used in the Easter Sunday Eucharist Service at Rochester Cathedral and the rest will be available in Autumn 2006. Made possible with support from the Arts Council and Nottingham Trent University. Designed by John Morgan Studio, limited to 500 copies. Text by Paul Bonaventura, Mark Bradbury, Rachel Jacobs, Laura Knight and Louise Francis, Peter Lock, John Newling, Andrew Spira and Isabel Vasseur and photographs by Matt Bray.